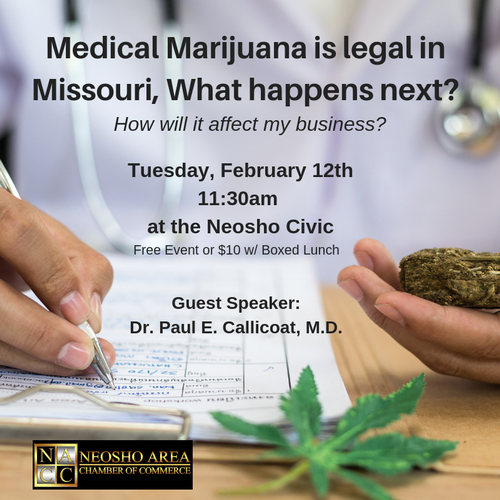 Medical Marijuana is legal in Missouri, What happens next? How will it affect my business? Dr. Paul E. Callicoat, M.D. 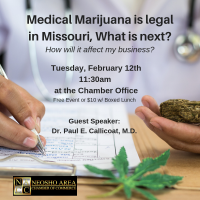 is our guest speaker and will be on hand to discuss the rules of the new amendment that legalizes medical marijuana in Missouri and how some rules may be important to local businesses. Dr. Callicoat is a retired Board Certified Interventional Cardiologist from Joplin, MO. and Co-Owner of Hops 21, LLC.